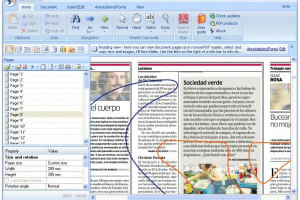 "Easily create and edit Portable Document Format (PDF) files"
Those among you not counting with dedicated and maybe expensive PDF editing and creation software, but looking for an alternative solution, consider reading on, as you might be interested in the product presented here, called Perfect PDF Premium. This application will enable you to fully manage your PDF documents easily. So, here we present the Premium version of Perfect PDF, which comes with a variety of professional features that can be used to easily create and edit PDF documents. As such, Perfect PDF Premium’s features encompass adding comments to your documents, changing PDF properties, editing its content, designing new PDFs, adding digital signatures, filling out forms, and even protecting your files with strong passwords. Furthermore, you will also be able to insert watermarks, backgrounds, stamps, among other related things.